Glioblastoma (GBM) is the most common malignant tumor of the central nervous system. Median survival of glioblastoma patients under standard therapy including radiotherapy and chemotherapy using temozolomide (TMZ) is 14.6 months. 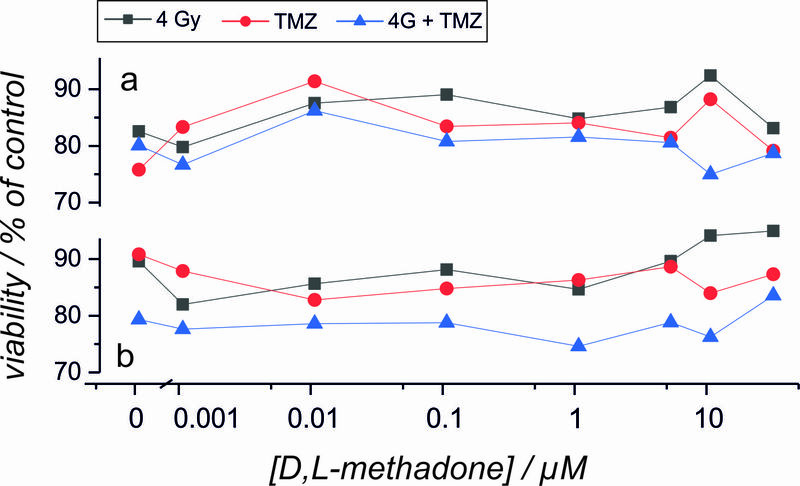 As cell culture experiments combining d,l-methadone with doxorubicin demonstrated an increased reduction of cell viability of glioblastoma cells, the opioid has been discussed as a drug for the treatment of GBM. 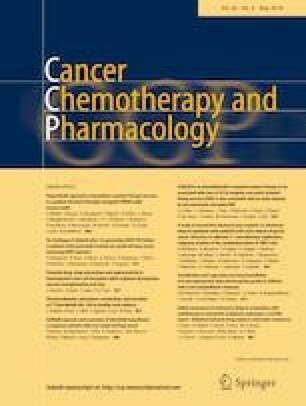 Despite lack of clinical and experimental evidence that d,l-methadone in combination with standard therapy will be beneficial, an increasing number of tumor patients medicating themselves with d,l-methadone present to the hospitals in Germany. As a first step towards understanding whether d,l-methadone may increase the efficacy of standard therapy, we used a cell culture model of primary GBM and fibroblast cell cultures derived from GBM patients. The cultures were treated with different concentrations of d,l-methadone in combination with X-irradiation, TMZ or both. Cell viability was determined by measuring ATP in cell lysates and dehydrogenase activity in living cells. 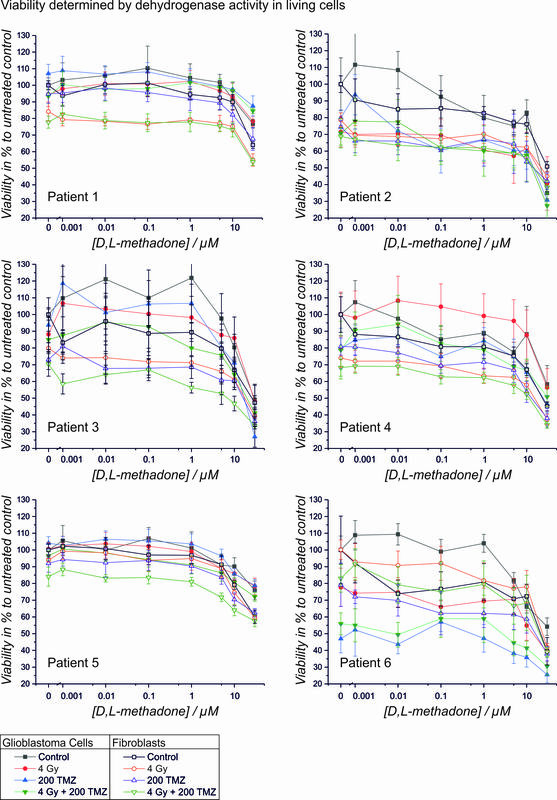 When only treated with d,l-methadone, 1 µM of the opioid was sufficient to reduce viability of fibroblasts, whereas 10 µM was needed to significantly reduce glioblastoma cell viability. In addition, d,l-methadone did not improve the anti-neoplastic effects of X-irradiation, temozolomide or both. 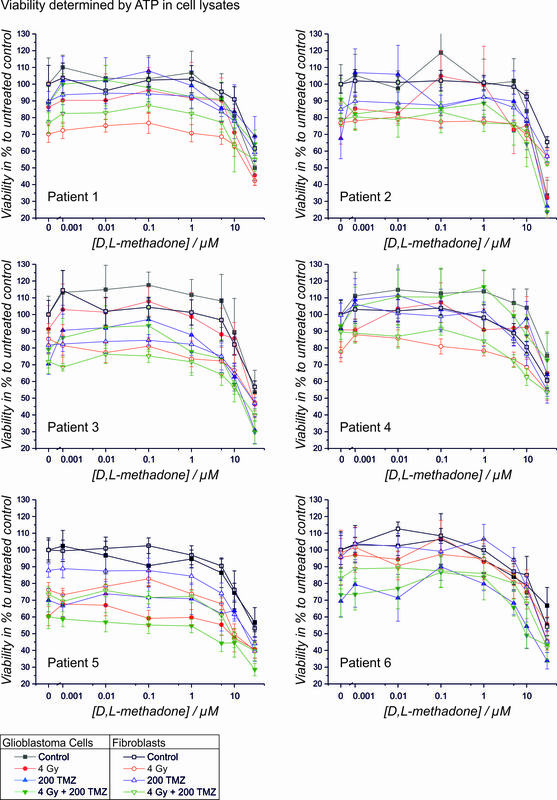 As d,l-methadone reduces glioblastoma cell viability only when concentrations are used that had been reported to be toxic to patients and as there were no interactions observable combining it with standard therapy, a recommendation for the use of d,l-methadone in glioblastoma therapy cannot be given. Henry Oppermann and Martina Matusova contributed equally. The online version of this article ( https://doi.org/10.1007/s00280-019-03816-3) contains supplementary material, which is available to authorized users. We like to thank Astrid Birnbaum (Department of Pathology, Medical Clinic Dessau) for determining the methylation of the MGMT promotor. All patients provided written informed consent according to German law as confirmed by the local committee (#144-2008) in accordance with the 1964 Helsinki declaration and its later amendments.